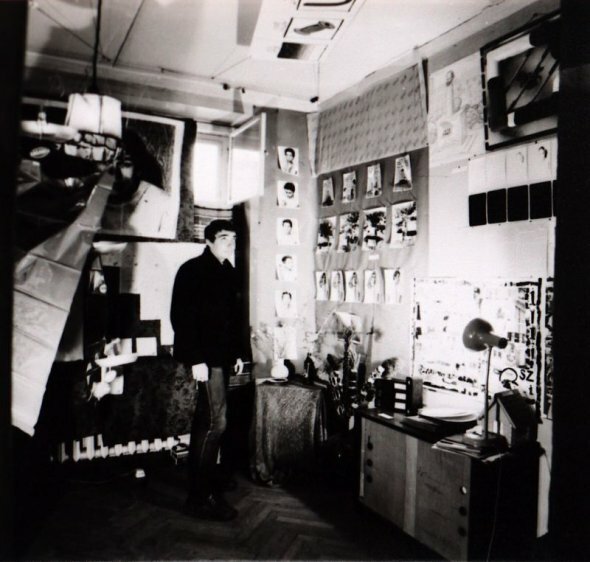 Nikita Alekseev in his apartment among works by Alekseev, TOTART, Mukhomor, and the SZ group. (Photo courtesy of Vadim Zakharov www.conceptualism-moscow.org). Installation view with works by the Mukhomor group. (Photo courtesy of Vadim Zakharov www.conceptualism-moscow.org). Vadim Zakharov among works by Zakharov, SZ, TOTART, Natalia Abalakova, Nikita Alekseev, and George Kiesewalter. (Photo courtesy of Vadim Zakharov www.conceptualism-moscow.org). 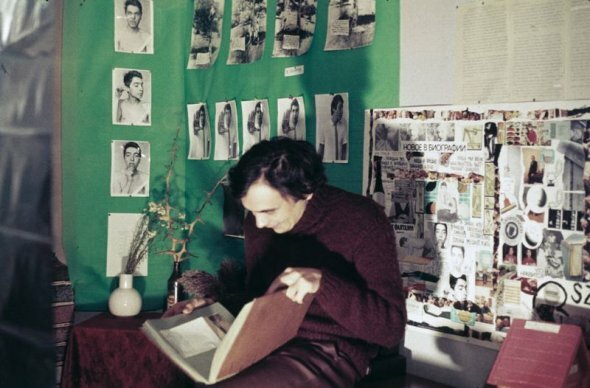 Andrei Monastyrski inspecting a work by Nikolai Panitkov among works by Vadim Zakharov (left) and Natalia Abalakova (right). (Photo courtesy of Vadim Zakharov www.conceptualism-moscow.org). Nikolai Panitkov and Mikhail Roshal amidst works by TOTART (Natalia Abalakova and Anatoly Zhigalov). (Photo courtesy of Vadim Zakharov www.conceptualism-moscow.org). 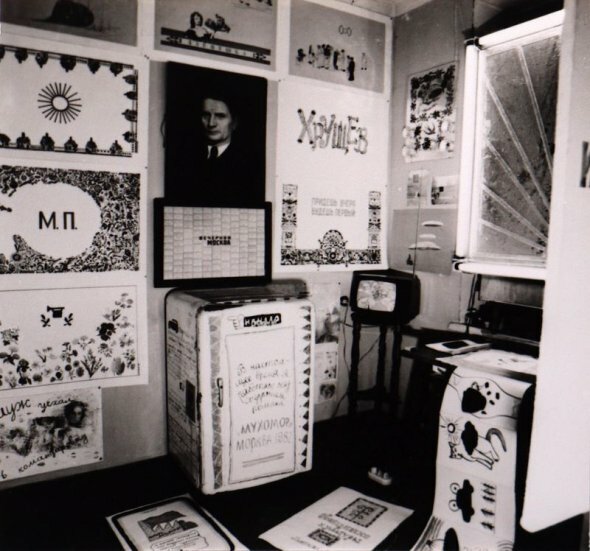 In the fall of 1982, the “APTART” exhibition was held in the apartment of artist and former member of Collective Actions Nikita Alekseev. 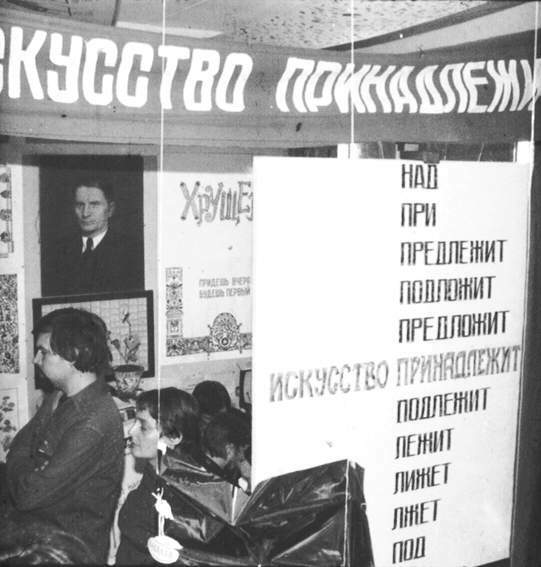 The show included work by a younger generation of artist collectives who had recently appeared on the scene like the Mukhomor (Toadstool) group and SZ, as well as several established Moscow-based Conceptual artists such as husband-wife collaborators Natalia Abalakova and Anatoly Zhigalov (TOTART), Alekseev, and fellow Collective Actions members Andrei Monastyrski and Nikolai Panitkov. Visitors to the show were both friends and members of the public who had heard about the exhibition through word-of-mouth. Alekseev granted access to the apartment “gallery” anytime that he was home. 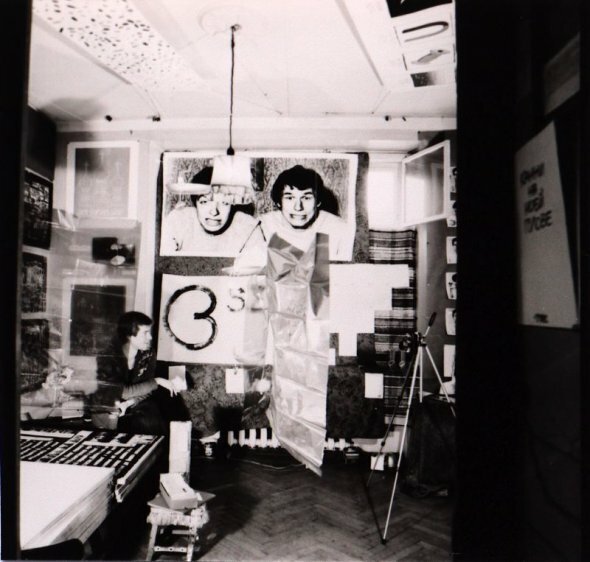 For the two-week exhibition run, works were hung on every available space in the apartment, filling each room to create a cacophonous environment where viewers could interact with the artwork and each other. 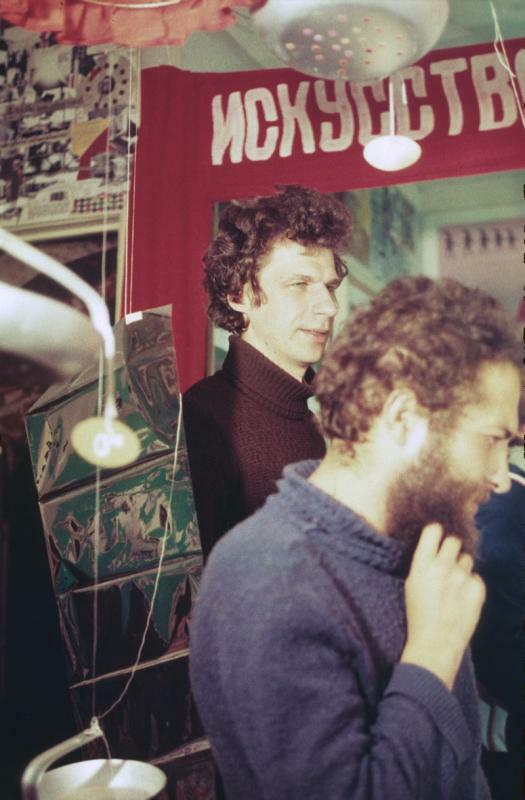 Both Zhigalov (in his artist’s statement) and Gundlakh (in his account of the event for A-Ya, the Paris-based journal on Russian contemporary art) described “APTART” as an attempt to break free from the habits and conventions that had set in among the artists of the Moscow Conceptualist circle during the 1970s, and gave the first indication of the colorful new art style that would come to be called the New-Wave in the 1980s.